Forbes began the pursuit of the world’s billionaires list 25 years ago. More than 50 reporters in 16 countries worked on compiling the list of world's billionaires this year, valuing individuals’ public holdings, private companies, real estate, yachts, art and cash. Net worths were locked in using stock prices and exchange rates from Feb. 14. Forbes first cut yielded 140 names with ten-figure fortunes (24 of whom are still in the ranks). 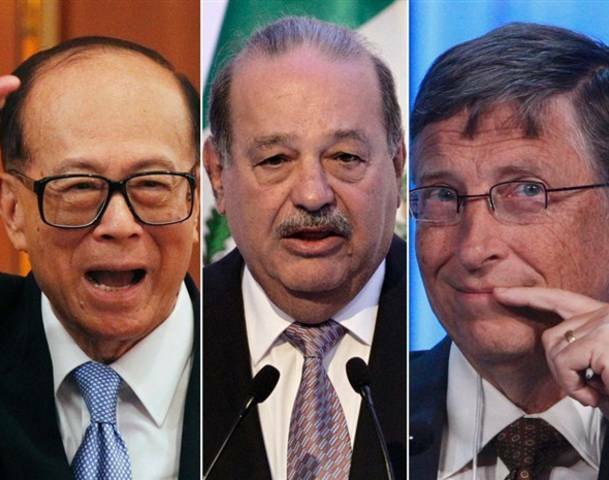 This year Forbes List of World's Billionaires lists 1,226 billionaires, an ­all-time high. At a record $4.6 trillion, the group’s combined net worth is up 2%. The average worth of a Forbes Billionaire is $3.7 billion. There are now billionaires from 58 countries including ones from Peru, Morocco and Georgia. U.S. is still home to more billionaires than any other nation, with 425, a dozen more than a year ago. Russia and mainland China follow behind with 96 and 95, respectively, down from 101 and 115. The BRIC nations, which were such a force of wealth creation a year ago, have 26 fewer ten-figure fortunes, with only Brazil adding to its bounty. This year there were almost as many list members who lost wealth (441) as there were who gained it (460). Only 180 held steady. Innovation, a rebounding Dow and vibrant IPO markets helped mint 128 new names like Glencore’s Ivan Glasenberg (No. 125) and Tesla’s Elon Musk (No. 634). Slumping commodities and Asian markets knocked 117 out of the ranks. Another 12 members from the 2011 list passed away, including buyout titan Teddy Forstmann and Apple’s Steve Jobs, whose wife Laurene Powell Jobs takes his spot. In total, there was a net increase of 16 billionaires, up from 1210 in 2011. Carlos Slim Helú of Mexico tops the ranks for the third year in a row, but the gap between him and Bill Gates is closing again. His fortune, at $69 billion, is down $5 billion. He was one of 7 in the top 20 whose fortunes slipped, including Warren Buffett and Larry Ellison. Bill Gates, whose foundation helped wipe out polio in India, added $5 billion to his pile and is now up to $61 billion as Microsoft shares hit a ten-year high. Amancio Ortega, the man behind fast fashion chain Zara, moved into the top 5, despite having stepped down as chairman last year. India’s Lakshmi Mittal, who runs the world’s largest steel company, ArcelorMittal, was the biggest loser. His fortune plummeted by $10.4 billion, knocking him out of the top 10 for the first time since 2004. He is ranked No. 21. Hong Kong’s Li Ka-shing, now ranked no. 9, reclaims title of richest Asian for the first time since 2004, despite a $500 million drop in his own net worth. Facebook’s Mark Zuckerberg is worth $17.5 billion, up $4 billion from a year ago; he may be worth far more once Facebook goes public this spring. Notable newcomers with stellar brands include Kevin Plank, founder of sportswear maker Under Armour, and Sara Blakely, with her Spanx line of newfangled girdles. Blakely, 41, is the world’s youngest self-made woman billionaire. Miuccia Prada, another notable woman in the ranks, returns to the list after a six-year absence. Two American immigrants to make their debut are the Jacksonville Jaguars’ Shahid Khan, who came from Pakistan when he was 16 and is the first minority immigrant owner of an NFL team, and 5-hour Energy’s Manoj Bhargava, who emigrated as a boy from India.